Last year we asked the question, does the Middle East need a curated web? It’s a question that certainly doesn’t have one correct answer, but one Serbian entrepreneur seems to think that is the case for the World Wide Web’s Muslim community as a whole. Speaking to Turkish daily, Hürriyet, Abdulvahed Niyazov gave some insight into why he’s launching a ‘Halal’ version of Facebook this July, coinciding with the Muslim holy month of Ramadan. Salamworld has already been dubbed the ‘Muslim Facebook’ by the Washington Post and PRI’s The World. However, as Gawker’s report earlier this month clearly shows, Facebook itself has a strict set of restrictions on the kinds of content that can be displayed on the social network. As the EFF explains, Facebook has come under constant fire for removing what the social network deems ‘harmful’ content – from banning images of women breastfeeding to removing a profile picture with instructions for a self-induced abortion, the latter of which, however, was reinstated. The question remains, is a new social network, introducing an entirely different kind of walled garden, the right approach for an apparently conservative community, regardless of faith, politics or any labels? Salamworld isn’t the first site available to Arabic-speaking users which aims to provide family-oriented content only, and certainly not the first Facebook alternative. IkhwanBook launched with exactly that kind of environment in mind, but it would seem that its affiliation with the Muslim Brotherhood organization was a deterrent for some, when it came to signing up for the service. YouTube is another site which has seen spin-offs created, providing only family-oriented content for its targeted Middle Eastern audience. All videos on d1g.com, for example, are curated by moderators and any offensive content is removed. Salamworld itself will have a strict curation method in place – including filters and moderators. The site has set itself the goal of reaching 30 to 50 million users within the next 3 years. Can Salamworld succeed where others haven’t? Taking a look at Facebook statistics in some of the predominantly Muslim populations around the world, Turkey itself is in the top 10, according to SocialBakers, with over 31 million users, and a penetration rate of 40%. Malaysia’s Facebook figures stand at 12 million, accounting for 46% of the population, while Egypt is third in line with 9 million users, a mere 11% of the population. More importantly, according to Alexa, Facebook is in the top 5 most visited sites of every Muslim country from Indonesia to Saudi Arabia, and is also the number one site in many of them, including Salamworld’s homebase, Turkey. On Twitter, Arabic also happens to be the fastest growing language on the social network. Salamworld is clearly facing stiff competition. Between Facebook’s figures, and similar projects that have failed to truly engage Muslim users, can Salamworld succeed? The network is certainly doing its best not to see that happen. According to Turkish newspaper, Sunday Zaman, Salamworld already has offices in Egypt and Russia, with a planned local presence in Indonesia, India, Iran, France, the UK, USA, China, Malaysia, Saudi Arabia, Kazakhstan, and either the UAE or Qatar by the end of this year. Salamworld’s budget for the next 3 years is $50 million. Unlike the Muslim Brotherhood’s rather quiet approach when it came to pushing its social network, Salamworld is taking a far more vocal and aggressive approach. But, at the end of the day, all of that doesn’t matter if Muslim users simply are not looking for an alternative to Facebook. While Salamworld does have a clearly defined target market, it’s unclear how much of that market, 50% of which are under the age of 25, want a social network which separates them from the rest of the world. Salamworld compares itself to location-based social networks such as China’s QZone and Russia VKontakte, but as Facebook continues to grow, it is slowly but surely edging outing any localized competition it meets. 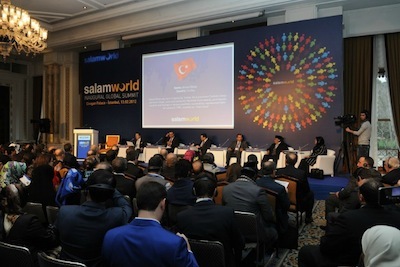 Could Salamworld’s approach of targeting a specific global community see more success? We’ll have to wait until July to find out.